BAPTISM OF THE LORD: The Feast of the Baptism of the Lord is celebrated on Sunday January 13, 2019 This is the last day of Christmas Time, formerly called the Christmas Season. 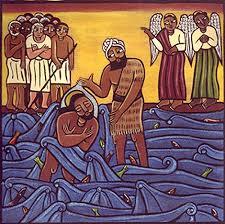 The Monday following the feast of the Baptism of the Lord is Monday of the first week of Ordinary Time. The feast is usually celebrated on the Sunday following January 6th. If the feast of the Epiphany falls on January 7th or 8th, the feast of the Baptism of the Lord is moved to Monday and treated as a regular weekday Mass although the Gloria is sung. When this happens, Tuesday, the next day, begins Ordinary Time.